Your Central SC “dream backyard” is within reach with our phased building program! How often do you catch yourself thinking…”if I just had an unlimited budget”? This is something we often hear during our initial meeting with homeowners, when we ask what they envision as their ideal outdoor living space. It’s a common misconception that the perfect outdoor living space is beyond affordable. Archadeck of Central South Carolina wants you to know you don’t have to delay creating your ideal backyard retreat any longer. We offer a phased building program that allows you to construct your outdoor living space combination project in phases as your lifestyle and budget permit. With our phased building program you don’t have to have an unlimited budget to get the backyard of your dreams! We start by working directly with you, the client, to put your vision of your ideal backyard retreat on paper as the “master plan” including all structures to be incorporated within the design. With this complete project design in hand, phase I is selected. This typically is the portion of the design closest to the home, maximizing the structural anchoring of this entire space to the residence. A clear “master plan” allows us to work out engineering, designing and building specifics for your complete outdoor space in phases permitting more efficient future additions or amendments. To ensure a unified outdoor environment, the structural integrity, traffic flow and ultimate function of each portion of the structure are priority considerations during each phase of building. Additionally, the advance planning of your backyard design saves time and money as it enables us to work closely with any supplemental contractors you may need for this project (i.e. utility contractors, pool company or landscaper). As the homeowner, having this freedom to build your ideal backyard in stages makes it easier on your budget and lifestyle. Prior to breaking ground, we will create a detailed project scope for you, as we do for all of our clients, whether we are building one outdoor structure or a combination outdoor space. This outline of the project’s highlights is especially vital, as it gives you a conceptual idea of your project as a whole and includes a detailed breakdown of the construction stages. We have found this to be the most valuable way to ensure no detail is overlooked. If your intended outdoor space is going to include more than one structure, such as an outdoor living combination of a deck, screened porch and hardscape, for example, then each separate structure will have its own distinct specification and materials list. This is just one of the many ways we are able to deliver the highest quality of service and product to our customers. We set the standards high because we want to make sure our customers are informed in every phase of their project, especially when the project is being built over time. Phased building with Archadeck of Central South Carolina allows you to feel like you have a new backyard during each stage of your dream outdoor living space construction. Much like many of our completed phased building projects, there is usually room for additional outdoor living area in the future, such as the integration of a fire pit and seating or a pergola addition to the deck. No matter which structure pairing or combination you choose, once your space is complete you can enjoy all the outdoor living opportunities to come. If you have a vision of your dream backyard but you’re not ready to complete it all at one time, our phased building program is the perfect answer. We can bring the backyard of your dreams to life one beautiful stage at a time. 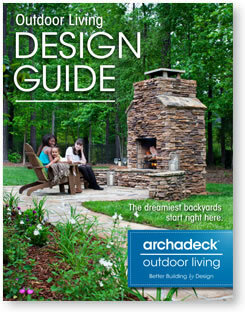 Contact Archadeck of Central South Carolina to learn more about our innovative approach to outdoor structure building. Call us for a free consultation at (803)603-2160 or email us at centralsc@archadeck.net. This entry was posted in Custom Outdoor Living Designer & Builder, Phased Building Program and tagged Archadeck of Central SC, Archadeck of Central South Carolina, Central SC combination outdoor living spaces, Central SC deck and porch outdoor living combinations, Central SC deck builder, Central SC deck designs, Central SC outdoor living combination builder, Central SC outdoor living combinations, Central SC patio builder, Central SC phased outdoor structures program, Central SC staged outdoor living structures program, Columbia SC Belgard hardscapes builder, Columbia SC deck and patio combinations, Columbia SC outdoor living combination designs, Columbia SC outdoor living combination structures, Columbia SC Patio Contractor, Columbia SC phased outdoor living projects, Columbia SC staged outdoor living projects, Columbia SC TimberTech decks, Making your Columbia SC dream backyard a reality on March 30, 2015 by archadeckofcentralsc. Imagine having a covered porch much like this one to host your own outdoor celebration. Labor Day weekend is one of the most popular backyard holidays conducive to outdoor living and recreation. Homeowners all over Columbia, SC, bid farewell to the summer of 2013 by hosting their own Labor Day festivities including backyard barbecues and outdoor parties for family and friends. Most of these parties took place on decks, patios and porches of residents all over Central SC. Having your own outdoor living space, whether it is a deck, patio, porch or a combination outdoor living space is part of what makes a house into a home. Outdoor living with family and friends is a way to catch up and be involved in the lives of the ones you love. Outdoor family time ensures quality time is well-spent with an abundant amount of fresh air and sunshine to make the moment more special. Being outdoors together is a facet of making memories with loved ones, especially here in the South. Not having an appropriate outdoor living space to make get-togethers more convenient and more enjoyable is a shame. 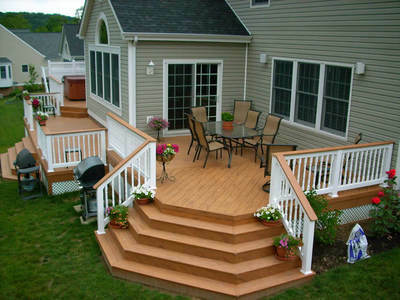 A spacious deck with all the trimmings will enhance your home and your lifestyle! Archadeck of Central SC has just the remedy to cure your outdoor living dilemma– a custom designed and built outdoor structure! We offer a wide range of designs to suit any taste or budget and deliver an abundance of function. An outdoor space addition will not only extend your outdoor living enjoyment, it will also add curb appeal and value to your home. Part of living the American dream includes the right outdoor space to enhance your home and the time you and your family spend together. 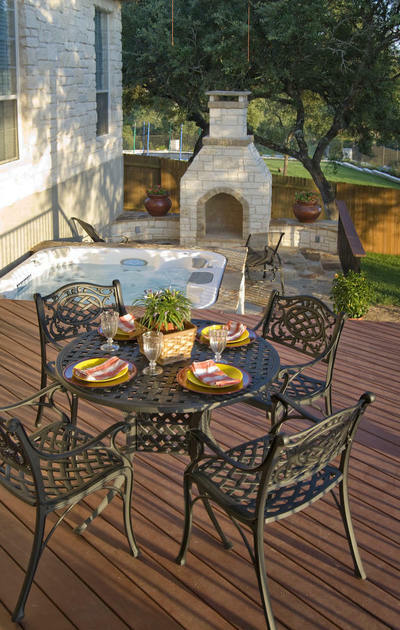 Backyard bliss can be enhanced with a custom fire pit or outdoor fireplace. I cannot think of a better time than the arrival of autumn to enjoy an oudoor living space. Hardscape patios, outdoor fireplaces and even fire pits are perfect additions to enliven your landscape and lifestyle year-round, and can become a focal point of outdoor entertaining during the fall. An outdoor fireplace or fire pit addition will not only add ambiance to an outdoor living space, they also produce some amount of heat which is welcomed on those chilly autumn evenings. The unforgettable crackle of fire mingled with the crackle of autumn leaves and the company of family and friends is timeless. 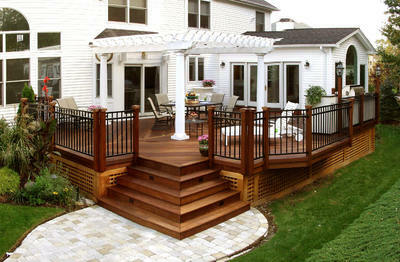 Try this composite deck and luscious spa deck on for size in your backyard. 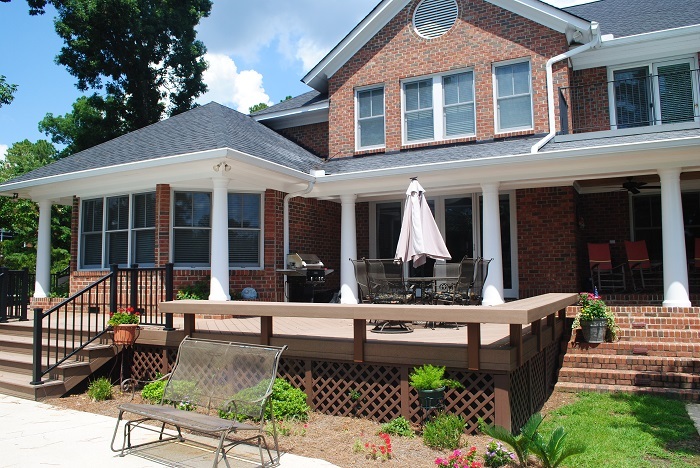 Since beginning Archadeck of Central SC ten years ago, we have become the area’s premiere builder for decks, sunrooms and porches in the region. 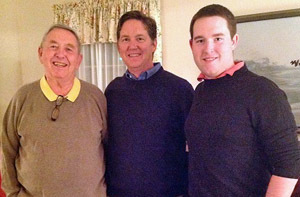 Our three-generation, family-owned company has created more than 400 outdoor living projects enabling our customers to take advantage of the natural beauty of the Central SC region and the mild climate we are fortunate enough to have almost year-round. Our outdoor spaces are designed with a keen eye for the holistic way homeowners now view their backyards with the goal of creating an outdoor escape. We bring a modern approach to outdoor structures steeped in the quality craftsmanship of a by-gone era. We specialize in creating unforgettable outdoor structures with attention to the smallest details and quality you can see and feel! Don’t let another outdoor opportunity pass you by. There are still many opportunities to take advantage of an outdoor living structure addition this season. Don’t put your dreams on hold any longer. This entry was posted in Decks, Entertaining, Outdoor fun, Outdoor Living, Outdoor living space design and building, Patio, Porches and tagged Archadeck design guide, Archadeck of Central SC, Archadeck of Central South Carolina, Central SC combination outdoor living spaces, Central SC deck and porch outdoor living combinations, Central SC deck builder, Central SC deck designs, Central SC outdoor living combination builder, Central SC outdoor living combinations, Central SC patio builder, Columbia SC deck and patio combinations, Columbia SC outdoor living, Columbia SC outdoor living combination designs, Columbia SC outdoor living combination structures, Columbia SC outdoor living space benefits, Columbia SC Patio Contractor, Creating the perfect Columbia backyard, Making your Columbia SC dream backyard a reality, Patios on September 11, 2013 by archadeckofcentralsc. This space is the perfect example of an outdoor structure combination at its best. The design includes a deck, pergola, hardscape patio and outdoor fireplace. 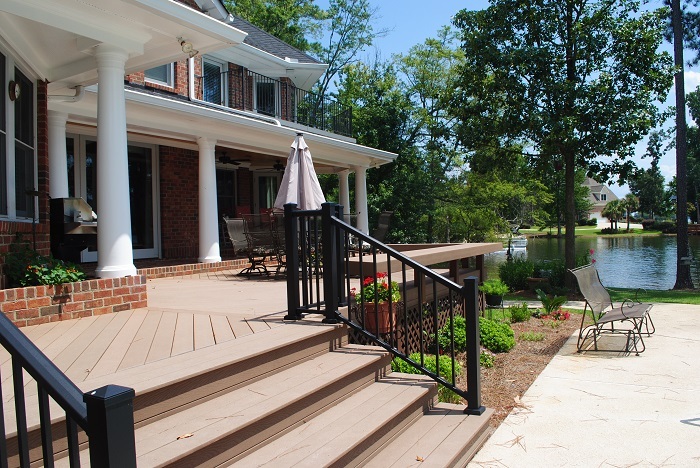 Being in the business of outdoor living design, Archadeck of Central SC keeps a close eye on which types of structures homeowners are asking for. Keeping up with outdoor living space design trends is an important way of being able to better facilitate the needs of our customers. As many design trends will fade from the spotlight over time, one trend that has proven longevity and is here to stay is the outdoor living combination space. The draw towards outdoor living space combinations persists because they are multifunctional and versatile. Combining different structures is a clear way to define separate areas within an outdoor living area as opposed to using one singular space to carry out all your desired functions. For example, a backyard deck can easily be built to provide ample space for dining and seating, but imagine the endless outdoor living possibilities if that same deck included a pergola and a space designated for grilling, or even an outdoor kitchen. Outdoor living combinations can be used as separate rooms, or vignettes, of beauty and function. The most wonderful part of our outdoor living combination designs is that a trio of outdoor spaces can function as one large design. We make harmony an important element of our designs. 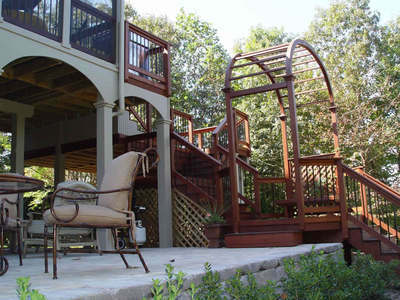 This deck features an arched trellis and spills into a spacious hardscape space below. Just off the 2nd story deck there is also a screened porch to enhance the space for extended periods throughout the year. Along with adding function to your backyard, an outdoor living combination can also allow you to enjoy facets of your space even when the weather isn’t so favorable. 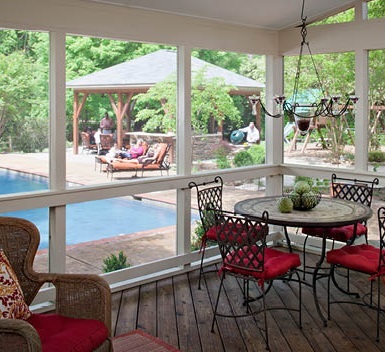 By combining a deck with a screened porch or 4-season room, you will be able to enjoy the ambiance of your backyard for extended periods of time throughout the year. 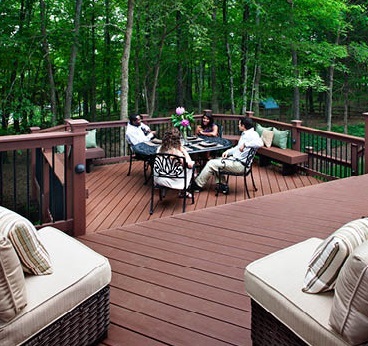 A deck that is warmed by the autumn sun by day may turn chilly once the sun goes down. By adding a four-season room to your outdoor living space, you can transition your entertaining or special time into a more suitable space and still take advantage of the outdoors. This entry was posted in Outdoor Living, Outdoor living combination structures, Outdoor living space design and building, Outdoor Rooms and tagged Archadeck of Central SC, Archadeck of Central South Carolina, Central SC combination outdoor living spaces, Central SC deck and porch outdoor living combinations, Central SC outdoor living combination builder, Central SC outdoor living combinations, Central SC outdoor rooms, Central SC patio builder, Columbia SC deck and patio combinations, Columbia SC outdoor living, Columbia SC outdoor living combination designs, Columbia SC outdoor living combination structures, Columbia SC screen porch builder, Columbia SC three and four season rooms on August 14, 2013 by archadeckofcentralsc. 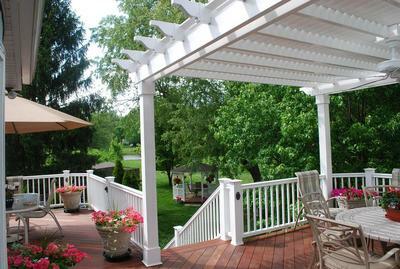 Is an elegant deck, pergola and patio outdoor living combination your ideal of a dream backyard? If so, we can make it a reality. Just because the 2013 Archadeck Dream Backyard Makeover contest has drawn to a close does not mean you still can’t have the backyard of your dreams! 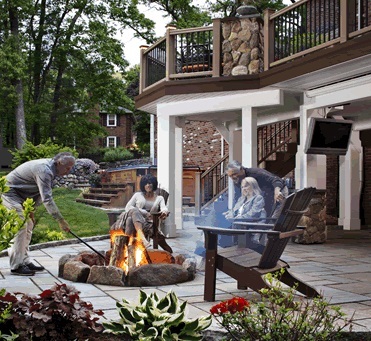 The grand prize winners of the contest were announced on May 17th, and they are to receive a custom outdoor space that incorporates a TimberTech synthetic outdoor space with Belgard hardscapes. This outdoor living combination is just one example of the many possible outdoor living choices you can dream up as your perfect backyard retreat. If you have been yearning for an outdoor oasis all your own, but taking on an outdoor living space combination is just too much to take on in one endeavor, Archadeck of Central SC can build the outdoor living space you have been wishing for one step at a time. Our Staged (or phased) building program enables you to plan and construct your dream backyard over time. Our phased building program allows homeowners the freedom to build your ideal backyard in stages making it easier on your budget, and with less of an impact on your lifestyle. Phased building consists of engineering, designing and building your outdoor space in phases so that future additions or amendments can be added easily. This is made possible by building with your future circumstances and the structural integrity of your project in mind. 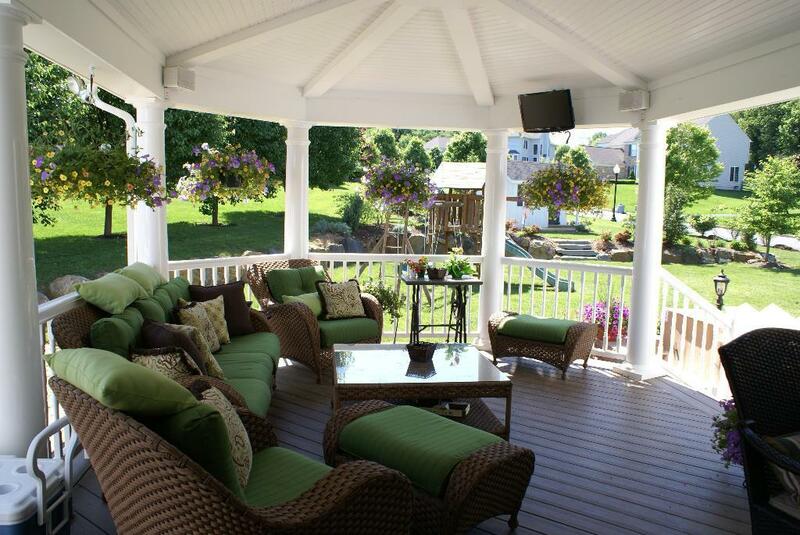 This backyard dream come true is located in Columbia and consists of an elevated screened porch and deck combination. We assist you in putting together a master plan to set your backyard dreams into motion. Archadeck of Central S.C. can assist in planning your ultimate outdoor space ensuring all the structural footwork is in place to facilitate future additions. We can begin with a dominant starting point and can also work in unison with your pool company, lighting company and your landscaper on the structural components needed to proceed with your grand backyard design. Our primary goal during our initial consultation is to understand your needs, desires, budget and priorities to come up with a plan custom made for you. For example, if your vision of the ideal backyard consists of a low-maintenance deck and backyard pool with a hardscape patio surround, we would suggest starting the first portion of your master plan closest to the house with the deck. It is always a good idea to begin your master plan working outward from your home. The primary reason for starting closest to your home is to ensure less lifestyle interruption. It also ensures that all primary structures are tied into your home structurally as you build out from the initial phase. There is less room to overcome obstacles that may arise when you begin a job working from the outside back to your home. The second portion of this backyard vision would entail working in unison with your pool installer to ensure every detail is accounted for and to facilitate each phase of your project. We also work with your electrician and plumber to get all your lines placed in advance to avoid retrofitting in the future. Laying the foundations for the additional phases of your master plan is an important part of your project. During this portion of construction we would concentrate on adding your backyard pool and the paver patio surround. Since the conduit and lines for the pool are already run under the deck and patio areas, installing the pool will not disturb these completed areas. Voila – your backyard dream has become a reality and, since it was completed in phases, the project was easy on the wallet and was not a major interruption to your lifestyle. Another benefit of staged building is that during each stage as we work toward fulfilling your dream of the perfect outdoor space, many homeowners comment they feel they get a new backyard over and over again. This entry was posted in Dream Backyard Makeover Contest, Outdoor Living, Outdoor living combination structures and tagged 2013 Archadeck Dream Backyard Makeover contest, Archadeck of Central SC, Archadeck of Central South Carolina, Belgard Hardscapes, Central SC combination outdoor living spaces, Central SC deck and porch outdoor living combinations, Central SC deck builder, Central SC deck designs, Central SC outdoor living combination builder, Central SC outdoor living combinations, Central SC patio builder, Central SC phased outdoor structures program, Central SC staged outdoor living structures program, Columbia SC Belgard hardscapes builder, Columbia SC deck and patio combinations, Columbia SC outdoor living combination designs, Columbia SC outdoor living combination structures, Columbia SC Patio Contractor, Columbia SC phased outdoor living projects, Columbia SC staged outdoor living projects, Columbia SC TimberTech decks, Making your Columbia SC dream backyard a reality, Patios, TimberTech on July 9, 2013 by archadeckofcentralsc.